I’m currently working on a product which uses a size 2430 “hobby” brushless motor and 25A electronic speed controller (ESC). In its “intended” use, the controller runs from two lithium-ion batteries with a total voltage of around 7.4V, but I want to run it from a mains-derived power supply instead. However, there are no off-the-shelf supplies available with that output voltage. Fortunately, there is no shortage of inexpensive Chinese switchmode supplies with standard outputs of 5,12,24V etc. Most (all?) of these have the ability to adjust the output voltage slightly, by around ±10%. 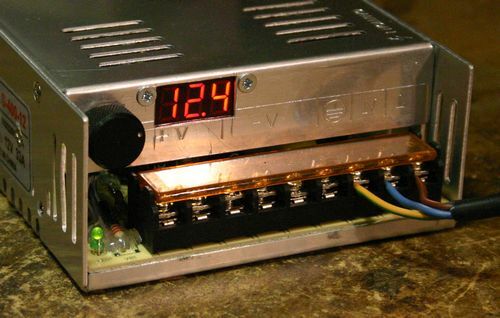 I reckoned that it should be possible to modify such a supply to provide a fully-adjustable output voltage which could be set to the desired 7.4V. This is by no means a novel idea – many people have modified supplies (a common mod is to increase the output to 13.8V, for ham radio use) – but I haven’t seen a good operational analysis of these supplies, so it’s a good excuse to do some detective work and figure out what makes them tick. Full details at Imajeenyus homepage. This entry was posted on Wednesday, May 18th, 2016 at 2:32 pm	and is filed under Teardowns. You can follow any responses to this entry through the RSS 2.0 feed. You can skip to the end and leave a response. Pinging is currently not allowed. Hey, thanks for the post!